Description: From 1 to 3 feet tall. 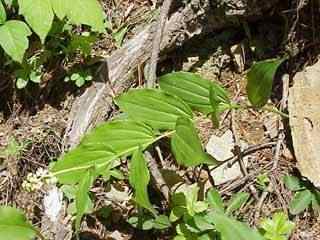 Leaves are in two rows with a short stalk alternating along the stem, slightly ribbed with a matted bluish green color showing iridescence in the sun. Very similar to Solomon's Seal except the flowers come off at the end of the stem in a spirea like cluster, rather than the lower side of the stem at the leaf axis. 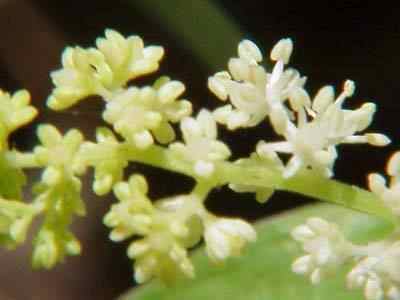 Flowers don't show the bell shape as Solomon's seal, they are creamy white in color with fruit as a berry, first whitish speckled with brown then turning ruby red.